Who can resist a prosciutto pizza recipe? How about lining it up with apples and onions? 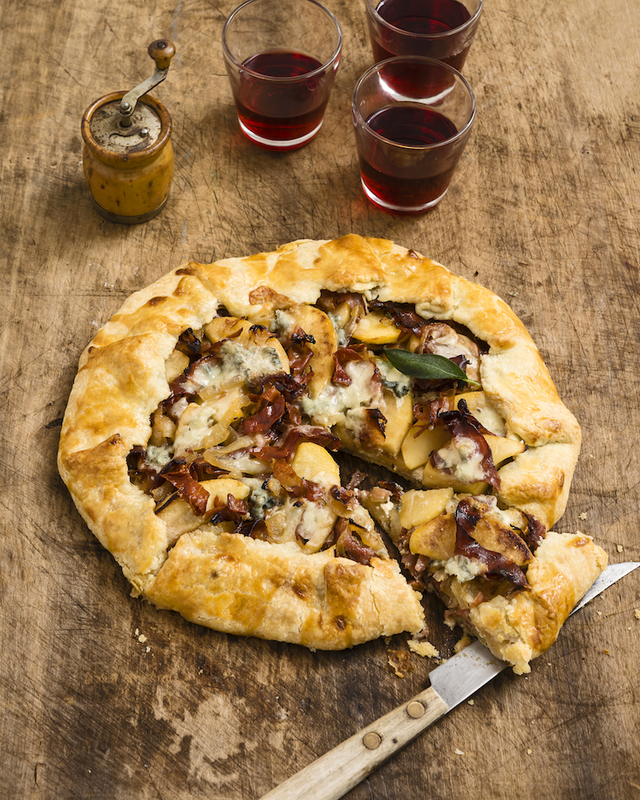 You may think you’ll be defeated by this apple, onion and Prosciutto di Parma tart, but we encourage you to have fun with it. You’ll want to strategically align all three ingredients across crisp pastry dough so each one gets an equal chance for devouring at once. Beware, this sizzling prosciutto pizza combination from our Specialist Chef Jenn Louis, of Lincoln in Portland, OR, is hotter than the Tuscan sun itself and you’ll want to play fair. Smart tip: you may want to serve with a few moist towelettes. In the bowl of a food processor combine flour, salt and sugar. With machine running, add butter and process until mixture resembles coarse meal, 6 to 8 seconds. With machine running add ice water in a slow stream through the feed tube just until the dough holds together (without being wet or sticky). Turn out onto a lightly floured surface. Knead dough a little to make it come together. If too crumbly you can add a little more ice water. Flatten into a disk. Wrap in plastic and chill at least 1 hour. Makes enough for one single pie or tart crust. In a large skillet heat butter over high heat. Add apples, onion, rosemary and sage. Cook, stirring frequently, until apples and onion begin to brown. Lay the pastry on a flour-dusted parchment-lined baking sheet. Roll into a 12-inch square. Spread ricotta cheese over dough leaving a 2-inch border. Top with onion and apple mixture. Dot with Gorgonzola. Fold up the sides of the pastry to enclose filling on the edges to make a rim. In a small bowl combine egg yolk and cream; brush on pastry. Chill tart 15 minutes. Bake tart 10 minutes. Rotate pan. Bake another 5 to 10 minutes until the crust is golden brown. Remove from oven; season to taste with black pepper. Cool on sheet pan.